A little changed early C19 proprietary chapel, now redundant. Starting in 1808, the large estate, which had been centred on one large house on the site of the Blackfriars dissolved in 1539 (see 1 Chapter 1), was divided into 61 plots for the construction of a New Town of fine houses. Development was under way by 1811 and there were already concerns about the lack of provision for worship. In accordance with the procedures of the day, an Act of Parliament was needed to establish a new place of worship and this passed into law in 1812. The Act provided for the construction of a proprietary chapel dedicated to St John, largely financed by shareholders who were allocated seats (Yates p106), though the intended beneficiaries were mainly the ‘lower orders’, for whom there were insufficient seats in the existing churches (Dallaway I p196) and for whom at least 250 seats were reserved (2 p2). The foundation stone was laid in May 1812 (1 p38) and despite disagreements with the architect and concerns about a bulge in one wall (1 pp44-45) it was completed the following year at a cost of over £7000, including land and fittings. The architect was J Elmes, who in 1818 exhibited his designs at the Royal Academy (Graves). During building he fell ill and J Haviland, a pupil, completed it (Colvin 4th ed p355). By 1822 structural defects had appeared and though the trustees considered suing Elmes (1 p72) they did not in the event do so. This may have been because he had disappeared from Chichester and future work was done by G Draper, appointed as architect to the trustees. He also altered and extended the galleries at the west end (ibid p73). 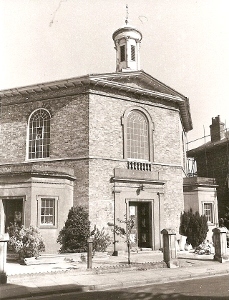 The continued Evangelical character of the chapel was the exception in Chichester and helped to enable it to survive both the Victorian age and war damage in 1944. However, the lack of an assured income was a constant problem and caused its complete closure from 1871-75 (1 p82). No lasting solution was found and after a prolonged period of debate it was joined to the parish of St Pancras in 1955 (3 p24), though amid increasing difficulties worship continued until 1973 After redundancy in that year, it passed in 1976 to the Churches Conservation Trust. Following repairs the chapel was used for occasional services and concerts from 1992 but a full restoration was only undertaken in 2003 under L Bainbridge (1 p53). The plan is an elongated octagon and it is built of white brick, briefly popular in the early C19, which weathers to a dirty grey, with stuccoed windows and doorways. It is now surrounded by buildings, so only the west end is accessible, though originally its surroundings were open. The west front when built stood behind iron railings that disappeared for scrapping in World War II, though the piers, reduced in height, survive. The central part of the front projects, with lower side extensions. Most detail differs little from domestic architecture of the period, even the large round-headed upper windows. The belfry, modelled on the Choragic monument of Lysicrates in Athens (VCH 3 p164), has Corinthian columns below a cupola. The interior has galleries on all four sides, supported on slender iron posts. The narrower east one contained the organ (now missing and replaced by a painted representation). It was placed here in a recess that has been removed (1 p50), rather than at the west end since it was a last minute addition after the belfry had been placed at the west end (Green p54). In this position it towers above the three-decker pulpit, which was intended as the focus of the whole chapel with a stem that seems to derive from a palm tree, a canopy and lower reading desks. The last have been altered and placed in line, apparently before 1879 (2 p6). 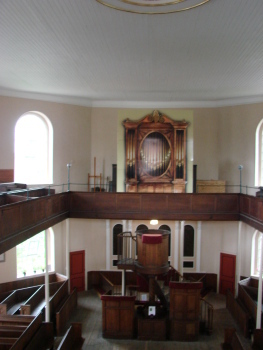 Tucked away beneath the gallery and behind rails with slender turned balusters is the communion table, with round-headed panels bearing the Commandments etc above. Either side, small doors lead to a utilitarian lean-to structure, which contained a vestry and privy and a coalhole respectively. Because there have been few changes, St John’s is a precious survival. New and lower pews were installed as part of the renovations in 1879 (1 p85) carried out by a local builder, but they are still numbered to assist pew-holders to identify their correct one and one bears a to let notice. 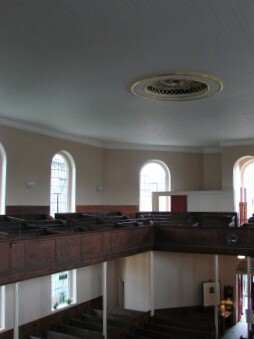 Otherwise, the layout was unchanged, with pews facing inwards to the pulpit and surrounding the table on three sides. Those in the balcony, perhaps because they had been constructed lower, were never replaced. In 1927 the perilous condition of the plaster ceiling led to its replacement by a boarded one (CDG 74 (NS) (1927) p50). Originally uncoloured, it has more recently been painted white, though still plain except for a rose at the centre. As a non-parochial chapel it was not permissible to hold baptisms there, so there has never been a font.